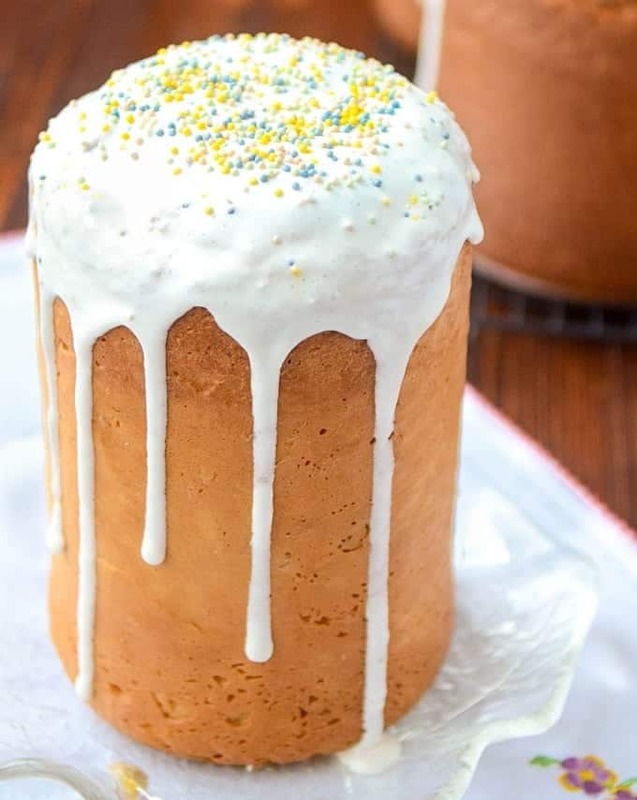 Paska or Kulich is a traditional Easter bread that is very popular in Eastern European countries. Every country has its own spin on this classic. Today I’m going to show a traditional Ukrainian recipe, the one that my family has been making for years and the one that never lets us down. This year Orthodox Easter is the same day as Catholic Easter. Also, this year, my daughter turns 4 on Easter. So, as you can imagine, we have a quite busy weekend coming up. Since, I’m Ukrainian, we always celebrate Easter the traditional way. We color eggs, we prepare Buzhenina (Roasted Pork Tenderloin) and we make Paska Easter Bread. On Sunday, we usually go to church to bless our Easter basket followed by a festive Easter brunch. When I was living in Ukraine, my mom was usually responsible for Easter menu. I rarely was involved. When I moved to the US and started my own family, I wanted to stick to the traditions and started making my own Easter bread. 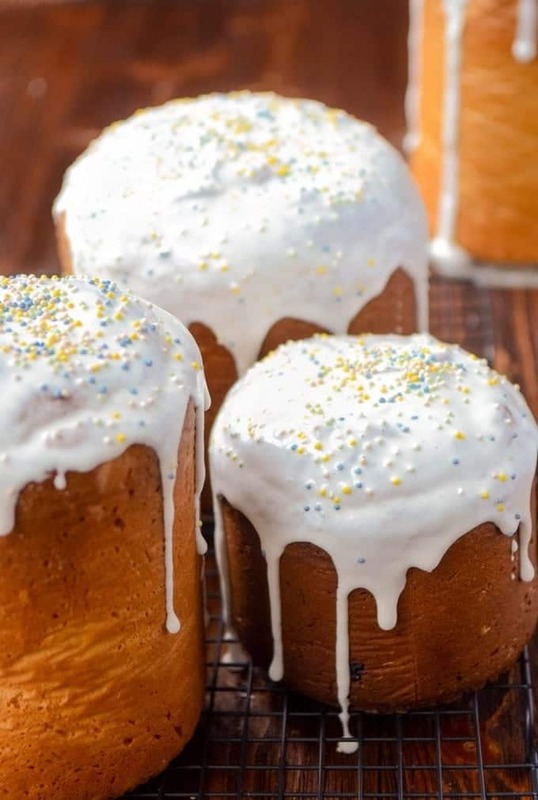 Paska is considered a festive Easter bread. Most of the time it’s sweet, glazed with sugar or sugar and egg white mixture. Many people also add raisins or dried fruits inside the bread. In Western parts of Ukraine, locals love making Paska plain with just a bit of sugar and eating it with kielbasa. My husband actually prefers it that way. In my family, we love Paska on the sweeter side with raisins, sugar glaze and sprinkles. It’s delicious, flavorful, very fluffy and moist. We often have Paska with tea instead of dessert. Today, I’m going to show you a step-by-step recipe of this traditional Eastern European Easter bread, so you can make it at home and surprise your family with a new and very delicious Easter treat. A few words on the equipment. Traditionally, Paska is baked in round and tall molds. Here you have several options. First – you can buy disposable paper molds, like these. These are also available in stores like Sur La Table. Walmart might have them as well. When we lived in Chicago, we used to buy these several times. Another option is to buy reusable metal molds, like these. That’s what we are using. We bought them in two sizes: 4 3/4-Inch and 4 – Inches. The third option is to look for tall ovenproof metal round ware that you might have around the house. For of our 3rd Paska we used kitchen utensils storage container. It’s quite tall with thick walls. We lined it with parchment paper and boom, Paska mold is ready to be filled with a dough. 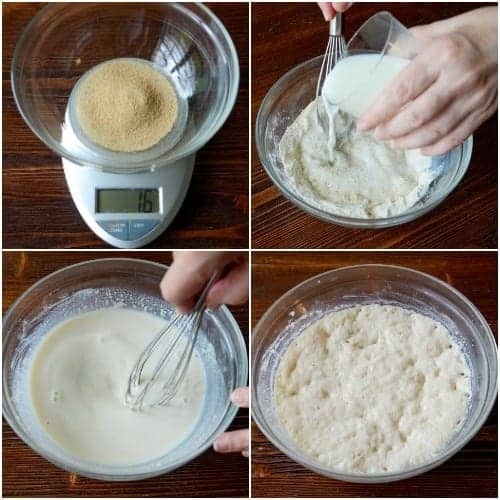 Start off with making “opara” – yeast mixture. In a medium bowl combine yeast, sugar, flour and warm milk. Whisk, cover with a plastic wrap and leave it to rise in a warm place for about 30-40 minutes. In a large bowl of a food processor, sift flour. 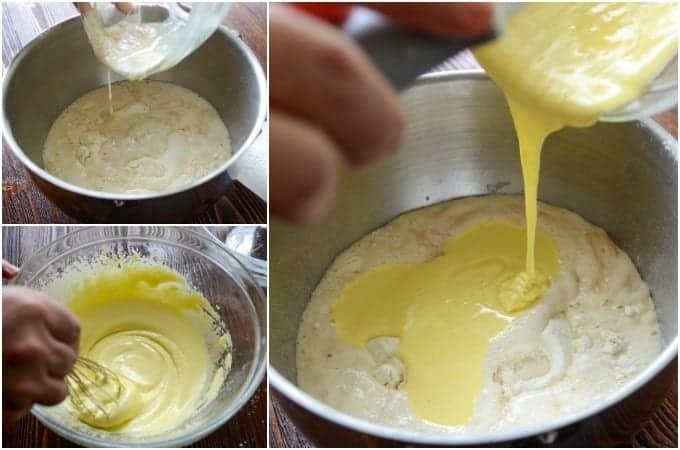 Add yeast mixture, salt and whisked egg yolks. Transfer the bowl to a food processor with an attached dough hook, knead the dough until small bubbles start to appear, about 5 minutes. Then, add melted butter, lemon zest and continue kneading until the dough is smooth and stretchy, about 10 minutes. Remove the bowl from a food processor. 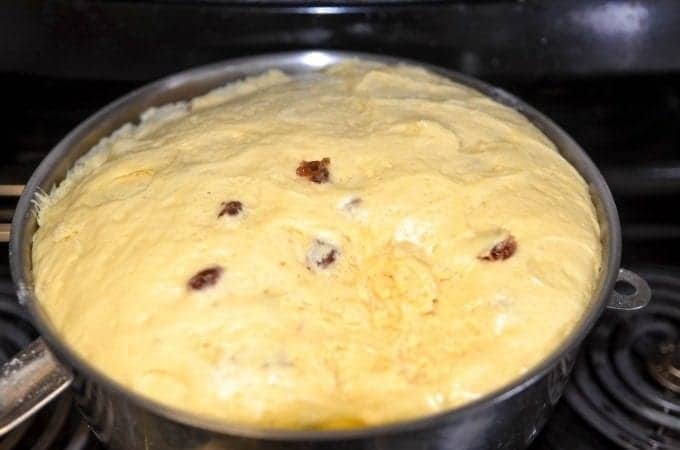 Sprinkle raisins with about 1/2 tablespoon of flour, stir and incorporate raisins into a dough. Mix just until combined. Cover the bowl with plastic wrap and dry kitchen towel and place it in a warm place. 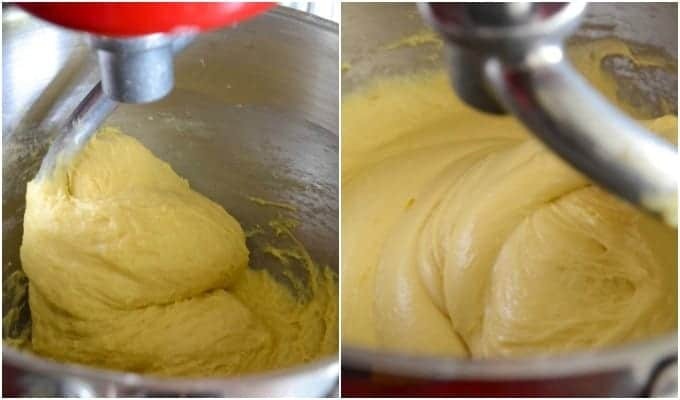 The dough should increase 2 times in size. It will take approximately 40-50 minutes depending on the temperature in your kitchen. Divide the dough between 3 parchment lined molds and leave it to rise until molds are almost full. Bake at 360 F for 45 minutes. 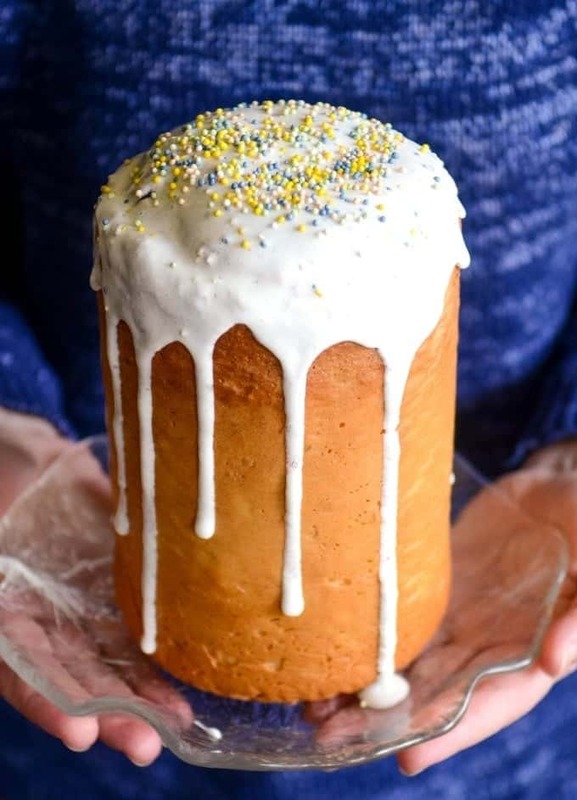 When Paska’s are ready, brush them with a glaze and top with sprinkles. Paska freezes exceptionally well and will keep for several months in a freezer. After you brushed Paska with a glaze, let it completely dry out. Then, tightly wrap it in a plastic wrap and place in a freezer. To thaw, simply unwrap Paska and let defrost at room temperature or in a microwave. Let me know in the comments below if you tried Paska before? What are some of your family’s Easter traditions? In a medium bowl combine yeast, sugar, 3 tablespoons of flour and warm milk. Whisk, cover with a plastic wrap and leave it to rise in a warm place for about 30-40 minutes. In a large bowl of a food processor, sift flour. Remove 3 tablespoons from it. Add yeast mixture, salt and whisked egg yolks. Transfer the bowl to a food processor with an attached dough hook and knead the dough until small bubbles start to appear, about 5 minutes. Then, add melted butter, lemon zest and continue kneading until the dough is smooth and stretchy, about 10 minutes. Remove the bowl from a food processor and stir raisins into a dough. Mix just until combined. Cover the bowl with a plastic wrap and dry kitchen towel and place it in a warm place. 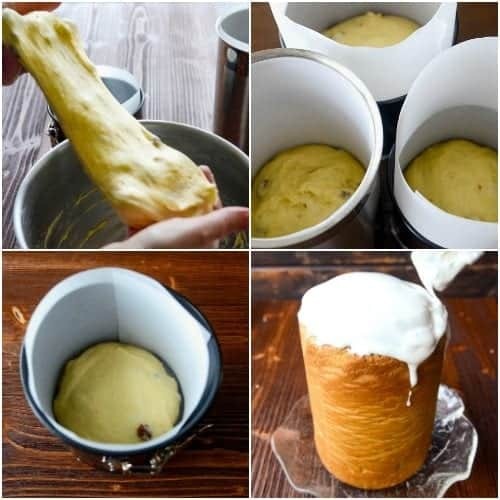 The dough should increase 2 times in size. It will take approximately 40-50 minutes depending on the temperature in your kitchen. Divide the dough between 3 parchment lined molds and leave it to rise until molds are full. Bake at 360 F for 45 minutes. When Paska's are ready, carefully remove them from a mold and lay them on their side to cool. Brush them with a sugar glaze and top with sprinkles. In a small bowl, dissolve 1 teaspoon of gelatin with 2 tablespoons of cold water. Leave it for 5 minutes. In a small sauce pan, add sugar and the remaining 4 tablespoons of water. Heat on a medium heat until sugar dissolves. Off the heat, add gelatin and whisk until gelatin is fully dissolved. Using an electric mixer, beat the gelatin and sugar mixture until completely white, about 2-3 minutes. Let the glaze cool slightly and using a pastry brush cover the top of Paska with a glaze. If you make this recipe, don’t forget to snap a picture and post it on Instagram with a hashtag #lavenderandmacarons. I’d love to see your creations. These kulich were so easy to bake and texture was beautiful. I was quite pleased until I tasted it and oh dear, I forgot the sugar. They were still good ,but I will be remaking them for Easter with sugar. Haha, won’t be my first Holy week baking disaster. Oh no…lol! Let’s just say you had a Western Ukrainian version of Paska:) They love it without sugar and glaze. That’s actually how my husband prefers it too. Well, I hope your second try will be a success. I hope you have a happy Easter! Thank you for sharing such a great recipe. I made two satisfying paska. Hi Ann Marie, if milk is not warm enough, the yeast might not get activated hence there might be a problem with the dough rising. It shouldn’t be hot either. Milk should be at 110-115 F.
I would really appreciate a conversion of the ingredients to cups and tablespoons. For example, how much is 32 grams of yeast? Hi Lily, I updated the recipe to cups and tablespoons. Hope that helps!